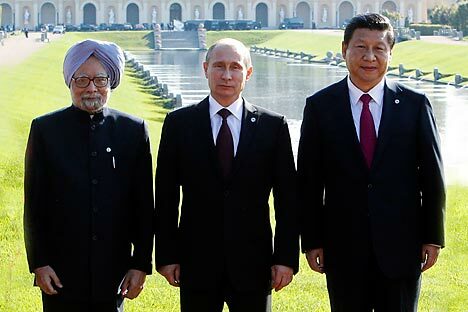 Unless an active effort is made to remove the fear of the Middle Kingdom from the minds of the Indian public, there will be few takers for the idea of a Russia-India-China alliance. So strong are the pro-Russia sentiments in India that a summit between the leaders of the two countries would be viewed positively even if the only outcome is an exchange of smiles, handshakes and declarations of friendship. Even those that are unabashedly pro-Western in India and desperately seeking a Green Card grudgingly admit that in the grand scheme of things, Russia is one of India’s most reliable partners. However, the concept of a Russia-India-China (RIC) alliance is a hard sell in a country where many view India’s northern neighbour as hostile. India’s humiliating defeat at the hands of China in the 1962 War has badly affected the national psyche and even after five decades, the scars of the brief Himalayan border confrontation have not healed. The Indian government and defence establishment both view China as a potential threat and this is reflected in tight visa restrictions for Chinese nationals who want to visit the country. Then there are the private television channels that hype up border incursions by the Chinese army and create some sort of hysteria. It wouldn’t surprise me if some of these channels and anti-China think tanks and analysts in India are on the payroll of Western arms suppliers, who would be the biggest beneficiary of hostilities between the two Asian giants. If more Indians visited China, they would understand that the country and its people do not reciprocate the hostility that many in India have for the giant neighbour. Essentially the India-China rivalry exists only in the minds of Western and Indian analysts. Most Chinese have very little access to information about India and since the state-run media is not obsessed with maligning the South Asian country, there is an overall positive feeling. Besides, for China, the real enemy will always be Japan, which was responsible for 20 million Chinese deaths during the Second World War and till date has not had the decency to apologize for wartime atrocities. Then there are the flimsy arguments in India on the lines of China supporting Pakistan and propping up the country against India. Why do these China-haters not have issues with America’s almost unconditional financial aid and arming of Pakistan then? What about Saudi Arabia’s support of India’s most hostile neighbour? America’s support of Pakistan hasn’t stopped many an Indian of dreaming of a better life in the “Promised Land,” nor does Saudi backing of the Islamabad act as a deterrent for those seeking a livelihood in the kingdom. It’s obvious that there is an industry in India thrives from the paranoia surrounding China. Many in India call for better trade relations with Pakistan and movement in other areas, despite the latter’s occasional insistence that solving the so-called Kashmir dispute is the only way to move head. China on the other hand talks of “harmony with differences” and wants greater engagement and people-to-people contact with India, yet few people are ready to take Beijing at face value. The reason behind this is clearly the lack of both political will and the correct overtures from those in power in New Delhi. In Russia, there have long been fears that China is planning some kind of demographic invasion of Siberia and the Russian Far East. In fact, the two countries have had their fair share of wars over the centuries (compare this to just 1 minor war between India and China). Yet Vladimir Putin made relations with China a priority of his foreign policy and has worked tirelessly to develop political and business ties with the one-time adversary. This has clearly benefitted both countries. With greater engagement and strong political will, the fear surrounding China in Russia has drastically reduced. Russia is the initiator and backer of the RIC concept and strongly believes that greater engagement between the countries in a multi-lateral format would help all three countries economically and also help bring about a more just world order. India needs to show greater pragmatism when it comes to China and use both RIC and BRICS as a way to improve relations with its northern neighbour. The Indian security establishment clearly understands that China has no nefarious designs when it comes to India and is not planning to destabilise the country. A stable strong and booming India is in China’s best interests. Given the fact the Middle Kingdom thrives on trade, political stability and economic growth in India would only mean an increase in exports of Chinese products to the country. Clearly, India needs to follow the Russian example and develop better and all encompassing ties with China, the initiative for which has to come from the top. New Delhi needs to make a clear effort to promote diplomatic and cultural ties with Beijing even if there is opposition from the Sinophobes in the country, many of whom are backed by those that are clearly not well-wishers of India. The concept of RIC will only be acceptable to the Indian public, if the government treats China like a partner and helps remove misplaced public fears surrounding the country.